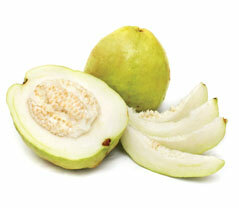 White Guava Pulp is obtained from sound, ripe Guava (Psidium guajava-Mytrace) by mechanical process. The Soluble solid contents of freshly extracted Guava pulp shall not be less than 10% m/m as determined by refractometer at 10°C uncorrected for acidity and read as Brix in the international Sucrose Scales. The pulp/ puree is strained free from peels, part for stones, other coarse parts of guava and other substances or impurities. Flavor : Sweet acid typical off freshly extracted Guava pulp from mature, well-ripened fruit, free from cooked flavor and off-flavors of any kind.